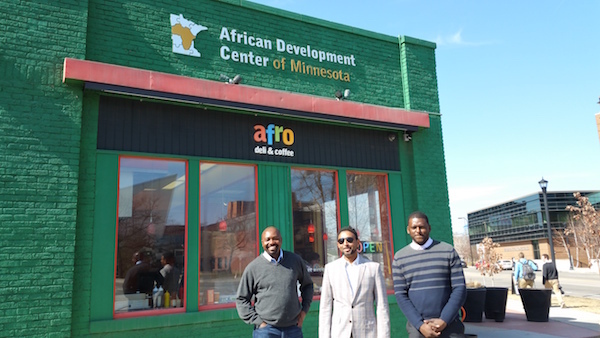 In its effort to promote neighborhood economic development, the Welcoming Center for New Pennsylvanians always strives to find innovative ways to achieve this goal, and that is what took the Small Business Program team to Minneapolis. 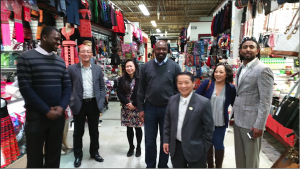 The Welcoming Economies Global Network (WE Global Network) sponsored a “city-to-city visit” by the Welcoming Center’s Small Business Program to the Neighborhood Development Center (NDC) to learn about their nationally renowned entrepreneurial business curriculum. The innovative curriculum is built on the premise that low-income residents of inner cities possess the entrepreneurial talent and energy to revitalize their neighborhoods. What they lack: sound business training! The Welcoming Center joins six other organizations across the country in the Building From Within Alliance, spearheaded by NDC, that have or are working to implement the NDC model locally. The Welcoming Center will be working in West and Southwest Philadelphia in collaboration with the Philadelphia Commerce Department Office of Neighborhood Economic Development. To ensure that this becomes a shared learning experience, the Aspen Institute has been engaged by NDC to work with the implementing organizations to develop monitoring and evaluation tools for the pilot. The Welcoming Center has launched an aggressive recruitment campaign in West and Southwest Philadelphia to recruit underground businesses for the twelve week class and is collaborating with the local Community Development Corporations (CDCs) to help identify vacant commercial space in the neighborhoods, as well as micro lenders to provide credit building training and eventually lending to the entrepreneurs. NDC uses a “Hub and Spoke” system to reach underground entrepreneurs across neighborhoods and cultures. This system requires the implementing organization to utilize talent from within the communities being targeted to offer training in a culturally acceptable way. The Welcoming Center Team on the right – Abraham, Herman and Boubacar at NDC training room with Isabel Chanslor, Lisa and NDC trainers. 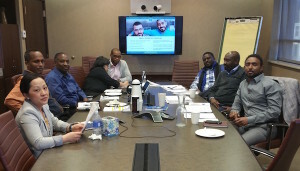 The Welcoming Center team included Herman Nyamunga, who directs the small business program and two consultants, Mr. Abraham Mulugheta and Boubacar Diallo, from the Eritrean and West African French speaking communities of West and Southwest Philadelphia, respectively. Our visit started on the morning of March 10th with an introduction to the NDC by the organization and it’s “Plan It – An Entrepreneur’s Guide to Success” curriculum. We are very excited to implement the curriculum in Philly’s West and Southwest communities. Mihailo Temali with Philly team members Herman and Abraham. In the photo are Mr. Shong Yang, standing in front, Mr. Jack Yang, NDC Trainer, and Haiyen, an NDC graduate. 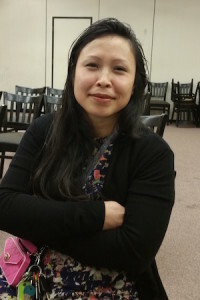 The Hmong Village is an old school district office complex which has been transformed into an amazing mall catering to the Hmong community in the Twin Cities. The second day was spent visiting partners, trainers, and program alumni. NDC’s success over the years can be attributed to the strategic importance it places on partnerships, which was evident in our visits to partner organizations and in conversations with the staff persons we met. This collaborative approach is critically important to organizations that want to grow their capacity but feel constrained by resources. Vital to the success of this approach is transparency about the organization’s goals and intentions. Among the people we met with includes Ms. Nieeta Presley, Executive Director of Aurora St. Anthony Neighborhood Development Corporation (ASANDC) whose organization has taken the lead in developing the oldest African community in the Twin Cities, The Rondo. They have collaborated with NDC in using their curriculum and leveraging their real estate expertise for community redevelopment and asset building. 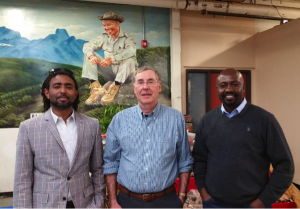 The Philly team from left to right: Herman Nyamunga, Abraham Mulugheta and Boubacor Diallo visiting the African Development Center, a local organization whose founder worked with NDC and was later supported in forming his organization now championing the entrepreneurial and economic development of the African community. Ms. Haiyan, a graduate of the NDC Plan it Training Curriculum who has gone to start five clothing outlets and just completed a franchising deal for the first store. Is your community a WE Global member? Learn how to get involved. The Welcoming Economies Global Network (WE Global) is a project of Welcoming America in partnership with Global Detroit. WE Global is comprised of more than 20 regional economic development initiatives from across the Rust Belt working to tap into the economic development opportunities created by immigrants. WE Global is designed to strengthen the work, maximize the impact, and sustain the efforts of individual local initiatives that welcome, retain, and empower immigrant communities as valued contributors to local economies.